The Clementi Pizza Party Oven is a luxurious new addition to the existing Clementi range. If you want to create a real first impression then this wonderfully crafted pizza oven will most certainly make a statement to friends and family. If you are thinking about splashing out on a pizza oven then here at Pizza Oven Reviews, we believe this is the most efficient, high end and quality piece of equipment we have seen in the pizza oven world. The Clementi Pizza Oven kit is great for those who have a large family, or those who want to start up their own pizzeria business! You could invite your friends, family (even neighbours) to a party or small gathering. This piece of kit will give you the WOW factor and you will become the talk of the town. 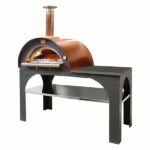 The Clementi Pizza Party is a wooden fuelled pizza oven which has a traditional and elegant look in comparison to other pizza ovens available today. We would recommend using Silver Birch wood logs, these are widely popular due to their availability and their proficiency, they’re also considerably cheaper with a long burn time. This wood burning pizza oven has an elegant look and will certainly stand out and make a statement. It comes with a large durable stainless steel stand in an Anthracite finish and would be a fantastic addition to anyone’s home or restaurant. The Clementi Pizza Party Oven isn’t easily portable due to the weight, but if you want to take it anywhere such as holiday home, or to a friends house, then the option is there if you want to dismantle it and reassemble it at the destination. The oven heats up to 400 degrees Celsius in just under 15 minutes which is impressive considering the size of the oven. Furthermore, it can produce up to four large pizzas at once! The Clementi Pizza Party Oven kit is on the larger side measuring 80 x 60cm (without the stand which is included in the purchase) and due to its heavy weight of a whopping 152kg it isn’t easy to move around, however you can rest assured that it can brave weather elements so you don’t have to worry about about moving the pizza oven inside during the winter months. The Clementi has a unique Air Plus System which means that there are small holes on one side of the oven, these little holes allow air to flow into the fire which improves the performance. This unique design enables you to cook a variety of different pizza styles (the Clementi can make 4 top quality pizzas within 120 seconds). The installation process of this pizza oven can be quite complex and it is advised that you seek a professional to help with the installation unless you have done it before or are an expert yourself. We believe that the value for money is reasonable in the fact that no other pizza oven kit can offer anything similar to the Clementi. 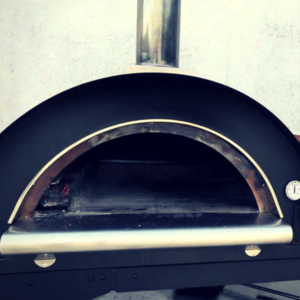 Overall, it is more on the expensive side but if you want the best pizza oven either at home or to start a small business pizzeria then we wouldn’t hesitate to recommend this to you! We believe It is by far the most advanced and useful pizza oven kit on the market.